1 of 5 Heat oven to 375 degrees . Fit a baking sheet with a rack and coat with nonstick cooking spray. 2 of 5 Place flour, egg whites and panko in separate shallow dishes. Dredge eggplant slices in flour, dip in egg whites and coat with panko. Place on prepared rack. Bake at 375 degrees for 45 minutes or until tender. 3 of 5 Spread 1 cup of the sauce over the bottom of a 13 x 9-inch baking dish. 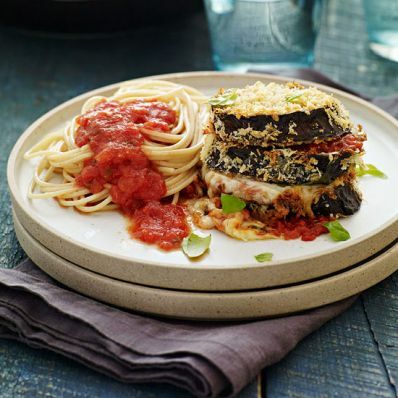 Place half the eggplant slices over sauce and season with 1/8 tsp each of the salt and pepper. Layer with 1 cup of the sauce, 1 cup of the mozzarella and the basil. Repeat layering with remaining eggplant, salt, pepper, sauce and mozzarella. 4 of 5 Sprinkle 1/4 cup of the Parmesan over top and loosely tent with nonstick foil. Bake at 375 degrees for 30 minutes or until bubbly. 5 of 5 Serve with cooked spaghetti, remaining Parmesan and, if desired, additional sauce.